Steph: *screams in Matt's ear, causing him to curl up in fear while she grins* ...It's coming from right next to you. Grunkfuss the clown can die in the hole he was spawned from. I love this pic, shame about the ...what, 3 times someone tried to claim it as their own work? Jerks! I especially love this fanart, nice! I had a lot of fun working on it! 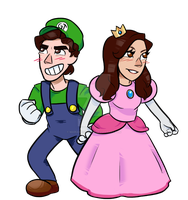 GTLive is always cool to watch, so I wanted to capture the experience. Hey, I wanted to know If i could use this in a GT fan game I'm creating called "Game Theory Alpha". All credit would be given. They better watch out! One of these Scary Games Friday's Peepachu will scare them right out of their skin. Perfect depiction of GTLive Scary Games Friday! Thanks! They provide great entertainment so I'm glad that I could show my appreciation! It is scary! It makes you think that you are drinking healthier, but you really aren't. This is really nice work here! Thanks! Glad that you enjoy it!